The rhyme for ‘F’ went like this: “Fitzhugh McGrew used to swim at the Zoo. The Penguins disliked this and the puffins did Too!” That was the only one of the rhymes I took a stab at illustrating (a study for it is pasted above). I got the idea for it from an experience I had while bartending at a party in the Penguin and Puffin Hut, at the Central Park Zoo in New York. I was working in front of a vast window with an icy penguin and puffin environment on the other side. In real life, the environment was larger and more complex than the one show in the illustration above. At first things we’re going OK. But then the lights dimmed, and suddenly went out. Apparently, the hut’s lighting was on a timer. The complete and utter darkness took me by surprise and I broke a vodka bottle, cutting my hand. There was nothing else to do but wrap the hand in a bar towel, and keep working. (Catering’s like the French Foreign Legion, you’re not supposed to leave your post.) When a captain came by, I asked him if he could get the lights back on, and get me some band aids. 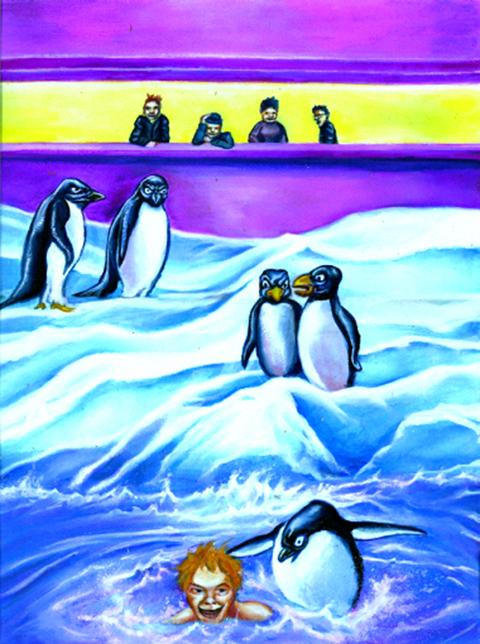 After a while, he was able to, and to my surprise, I saw dozens of angry penguins and puffins huddled next to each other on a distant ice patch on the other side of the glass. The birds looked like an angry block full of grown-ups ready to administer a beatdown to the punk kids whose rotten party was keeping them awake. They were giving me these looks that said in effect: “Hey — you with the tux — what the hell do you think you’re doing?” Ironically some of them seemed to be wearing tuxes, too. But they were an extremely diverse looking crew. Up to that point I had no idea of the bizarre range of physiognomies that belongs to this family of animals. A couple of them jumped into the water and swam over to glass directly behind my bar and spent some time giving me a piece of their mind. It seemed like it might be a long night for my avian associates. But, before long, a Zoo official got wind of the situation, and directed that the lights be dimmed to a very low level, and the music be turned down. After that, the birds resolved to live with the shindig. On my way out (after a 12 hour shift), the catering company asked me if I wanted to stay for a few more hours and load up the trucks, I told them: thanks, but no thanks. The last couple of hours disposing of barslop (there are no sinks offsite) had been enough. Large scale offsite catering is about the most brutal work experience you can have while wearing a tuxedo. but the various locales you encounter are a substantial upside. I’ll never forget my friends on the other side of the glass. The book was less vivid in my imagination. It got lost in the shuffle. I guess my heart just wasn’t in another 25 paintings based on alphabet rhymes. it probably wasn’t even in the first one, or there would have been a few dozen penguins and puffins, instead of just the five.